During a 60-hour deluge, four tubes were opened to allow water to flow through Glen Canyon Dam and down the Colorado River. Last week, the U.S. government unleashed billions of gallons of water from Glen Canyon Dam in a dramatic attempt to rebuild the Grand Canyon’s beaches. It’s too soon to say whether the experiment will help bring the canyon’s rarest flora and fauna back from the brink of extinction, but scientists are cautiously optimistic. Once upon a time, the Colorado River ran swift and brown from the Rocky Mountains through the Grand Canyon on its way to the Gulf of California. And nearly every spring, the river flooded. 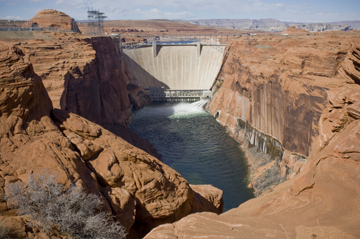 But since 1963, much of the river’s water and sediment have been trapped behind Glen Canyon Dam, a situation that has spelled disaster for the canyon’s most sensitive species. Today three native fish have become locally extinct and one species — the humpback chub — is endangered. The humpback chub depends on warm murky water and stable shorelines, but today’s Colorado River is clearer and colder than before. And the beaches that protect the backwaters they use for breeding have all but disappeared. By rebuilding these beaches, the federal agencies in charge of managing the Grand Canyon hope to create more habitat for the troubled fish and more campsites for outdoor enthusiasts. “You’re not going to bring it back to before the dam, but you can bring it back to a more natural state,” says Andrea Alpine, the acting director of the USGS Southwest Biological Science Center in Flagstaff, Ariz. This beach-building experiment has been attempted twice before, but neither of the previous floods were particularly successful. In 1996, scientists left the water on for too long, which meant that most of the sediment ended up on the bottom of Lake Mead instead of on beaches in the canyon. In 2004, there wasn’t enough sediment. And the beaches that were rebuilt eroded quickly, in large part because in the weeks and months following the high-flow experiment, the U.S. Bureau of Reclamation, the agency that operates the dam, varied the amount of water coming through the dam on a daily basis to match peak power generation with peak power consumption. According to Nikolai Lash of the Grand Canyon Trust, that’s not only bad for the humpback chub, it’s against the law. In 1994, the U.S. Fish and Wildlife Service recommended that the bureau provide a constant flow of water April through October during dry years. But the bureau has yet to heed the agency’s advice. In December 2007, Grand Canyon Trust filed a lawsuit against the Bureau of Reclamation, alleging that for the past seven years the bureau has been violating of the Endangered Species Act by failing to follow the Fish and Wildlife Service’s recommendations. It could take months or even years before Grand Canyon Trust’s lawsuit is decided. Meanwhile, scientists at USGS will be poring over the incoming data in an attempt to determine whether such floods help create lasting beaches and much needed habitat. “The amount of data we’re collecting will keep them all busy for a long time,” Alpine says.